was born and raised in Tiberias, joined the Army as a combat medic and served in Yom Kippur War, and Fought at the Golan Heights Occupation during the War he lost his leg in the Syrian Golan Heights enclave from a mine. 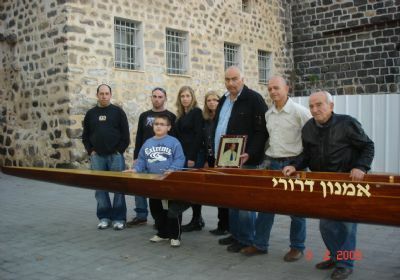 Amnon was one of the founders of the Association of The club in the 80s, he was elected as secretary of the Tiberias rowing club and played his role as secretary until his death, even when he knew that the end was approaching, his devotion and loyalty was still strong! Amnon worked as a senior official at Discount Tiberias bank, he was loved and respected by all customers and residents of the city, in his later years when suffered from the Muscular Dystrophy disease , he fought and led a normal life with determination and adherence. his death left Shocked and sorrow to his many friends who love and who are aware of his activity for the public, his death has left a huge void to his dear family and friends.